He looks just like my Schnauzer Jasper, except for the cropped tail, Jasper has a bottle brush for a tail. What a feisty, brave little dog . Miniature Schnauzer’s are so smart. So pleased Mary that you enjoyed the video. And thanks so much for commenting. Miniature Schnauzers certainly are delightful little dogs and I can imagine how much pleasure you get from having Jasper in your life. I wish you and Jasper heaps of fun and companionship for many years to come. Congratulations on your soon-to-be new Mini Schnauzer. That is exciting and I know you will have so many happy and wonderful times with your new family member. As you say Rosie, the transition will be hard for her. It will not be easy for you either, but so long as you have plenty of patience with her she should be able to live by your rules. But it may take time. With regards to her not being allowed on your furniture, my best advice is included in my recent article on this website. This is the link to the article https://trainingminischnauzer.com/how-to-stop-a-miniature-schnauzer-puppy-jumping-on-furniture The most significant information starts at: So How ARE You Going to Stop Your Miniature Schnauzer Puppy Jumping on Furniture? I put great emphasis about sitting on the floor with puppy and getting her to believe that the floor is a fun place to be. You will need to use treats, such as owners with young puppies use. Treats should do wonders. The most difficult part will be night time. I feel for both you and puppy in regard to this. Maybe you read my article on this website about Sleeping at night. If you haven’t read the article, I suggest you do read it as it may be of help in regard to you keeping strong and not letting puppy get the better of you! In respect to ‘wisdom’ to help you and puppy, I recommend that you ask the present owner of this puppy to provide you/puppy with an item that puppy can have in her crate at night. The item being a small blanket, cushion or any item at all that will have the scent of what becomes her previous/old home to bring to her new home. This will be a great help for her to settle into your home. You ask how you can become pack leader. There is an article on my website about being a pack leader, which may help you. A short form of being a pack leader is to tell your dog NO. When you have firmly said NO, don’t look you dog in the eyes. Show your disapproval. When your dog sees you are not interested in her, she should quieten down and behave. But, it depends on a dog’s nature. To become a good pack leader you need to be strong, and yet kind and loving towards your pet. If you have problems in this direction the best thing I can recommend is to look at perhaps just one month’s subscription with Doggy Dan. Not only is he a great trainer of dogs, his program also provides a forum where you can get access to other dog owners. 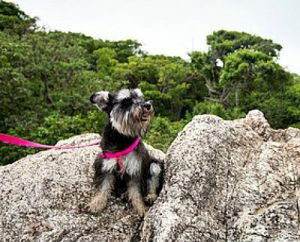 Alternatively, if you go to this page https://trainingminischnauzer.com/learn-how-to-be-pack-leader-of-your-dog you will see some red colored text to get expert training. If you click on that you will have the opportunity of some free Doggy Dan videos which may have enough information to help you sufficiently. I wish you and your new Mini Schnauzer many happy and fun packed years together. I enjoyed the video I love schnauzer They’re so sweet dog and love to play. I’m pleased to know you enjoyed the video. I couldn’t resist including it in that post! These sweet little dogs taking life seriously and at the same time having fun. So pleased you enjoyed it, and thanks very much for leaving your comment. What a wondrous day for Lando! I loved his never flagging eagerness to carry on. And, am wondering … how soon did he drop into sleep? I’m pleased you enjoyed the video and thanks so much for leaving your comment. I can’t say how soon Lando slept after that amazing exercise, as he’s not my puppy. This was a video I couldn’t resist sharing with lovers of small dogs. I’m sure it didn’t him long to curl up and go into a sound sleep.